The grand parade of Australian troops pass the Mitchell Library and the Royal Botanic Gardens in Sydney, 24 April 1915, Samuel J Hood Studio. Image courtesy Australian National Maritime Museum. 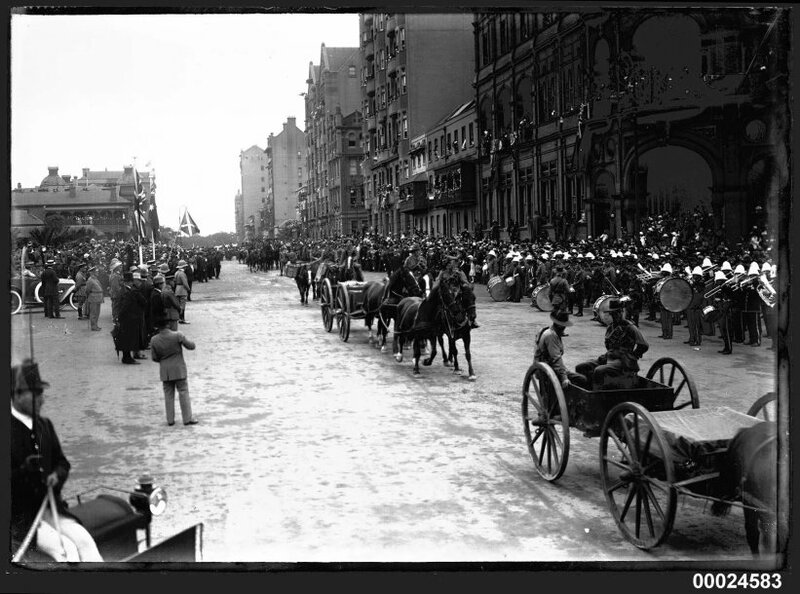 Over 5,000 troops participate in a military parade in Sydney, witnessed by over 200,000 spectators; clearly unaware of the events that would unfold at Gallipoli the following day. The march was a highly successful recruitment drive; on the Monday after the march so many volunteers presented themselves at Victoria Barracks that officials were unable to cope, and many potential recruits were turned away. Beginning of the Armenian genocide. Anticipating an Allied invasion, the Ottoman government attempts to secure the Empire by quelling any potential internal uprisings. 250 intellectuals and community leaders in Constantinople are rounded up and deported. More than 1.5 million Armenian people would ultimately be killed. This date is now commemorated as Genocide Remembrance Day or “Red Sunday” in Armenia. This entry was posted on April 24th, 2015.